In 1880 William H. Walker founded the photographic camera manufacturing business called Wm. H. Walker & Co. in Rochester, New York. 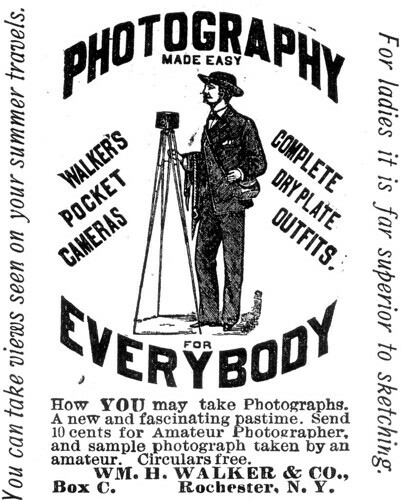 It made several variants of Walker's Pocket Camera, a handsome wooden box camera. In 1882 he joined with W. H. Reid and J. Inglis producing photographic dry plates. In 1883 Walker sold his businesses to W. F. Carlton who renamed the company to Rochester Optical Co.. In the same year Walker joined George Eastman's company. Together they introduced the Eastman-Walker Roll Holder for rollfilm for which they received a patent in 1885. They also got a patent on a new type of rollfilm. These inventions were the first steps of Eastman Kodak's later breakthrough with rollfilm box cameras on the market for popular photography. Walker became a manager of Eastman's English plant.